Just thought I'd share this photo from our week of stay-cation. I call it "Beauty and the Beasts". We caught a bunch of bizarre little critters, like a half-frog/half-tadpole and a ton of crawdads. My computer is still on the outs, but I am making due with two retired laptops that are slower than molasses. But beggars can't be choosers, as my Mother would say. I also realized that it is my 2nd Blogaversary this month: two years of fun projects, meeting cool people, and making interesting self-discoveries. THANK YOU for reading, commenting, and sharing your lives with me! Although, I am still on semi-hiatus, I thought I'd let you know what I've got mixing around in my little bag of tricks. In August, I plan on sharing with you the things I am doing to get ready to send my number one son off into the big bad world of Preschool. I hope to also share with you some of the tools that I use to teach my kids at home and do a review of some cool educational products from CSN, an online store which sells everything from dining room furniture to educational products for children. I want this dining set, but maybe with yellow chairs instead. The vinyl is tugging at my heartstrings. Right now we have fabric covered dining room chairs...and they are difficult to keep clean! Anywho. Check them out and stay tuned for my review of a few of their really nifty educational products. In September, I am planning on joining in with some other great bloggers in a "Proclamation Commemoration" to celebrate the 15 year anniversary of the announcement of The Family: A Proclamation to the World. I am looking for "guest bloggers", people who want to do a blog "exchange", share ideas, and anyone who would like to contribute to a BIG Family Proclamation GIVEAWAY! As I mentioned this will be happening on multiple blogs across the blogosphere. This was Cocoa's idea...I'm just jumping on her bandwagon! Let me know if you would like to participate! Just shoot me an email at jocelyn.christensen@gmail.com. fun ideas, I'm interested in family proclamation project. Happy 2nd Blogaversary! Thank YOU for sharing YOUR talents and sweet words/posts. 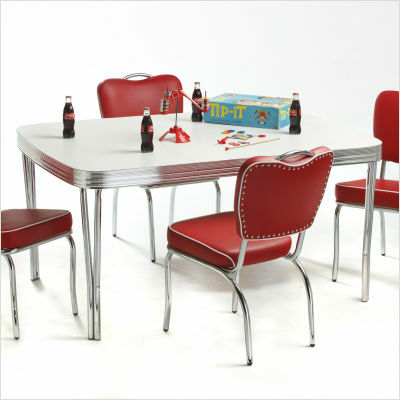 Last Summer I stopped at a rummage sale that had a similar dining room set from the 50's. Since she had it from her parents that bought it then she wanted a mint for them ( $1,000 dollars)...well I wasn't interested but the girl that came to the sale after me was bargining with her on a price. They were solid and super heavy. They were red and white, exactly like the one you have in the picture and they were in MINT CONDITION. You may get a replica like the one I found but it will never be the same as those were in the 50's. But I will keep an eye out for one and if I find one I will call you to see if you want me to hold with some cash until you get them. Good luck on getting one of those sets...HUGS!!!! Happy blogaversary! I too am suffering from a down computer. But you are so right. Beggars can't be choosers! that set is lovely...so perfectly vintage. hope you get it! It reminds me of Happy Days. And the Proclamation idea sounds like so much fun!! I'd love to learn more about it. Wow! Two years . . . you are a blogging veteran! Congrats. Thanks for stopping by F & J to say hi today for my guest post there. Your comment had me looking through all the photos of myself. Two discoveries: First, I realized that I have very few pics of myself. Second, I think I look like a different person in every single photo I do have. That's odd, and I've never noticed it before. I think that pic on F & J doesn't really look like me . . . I'm not sure why, but it's the only family pic I have with all of us together from the last seven months. I'm going to have to remedy that soon with another family pic. Enjoy the rest of your little blog break!